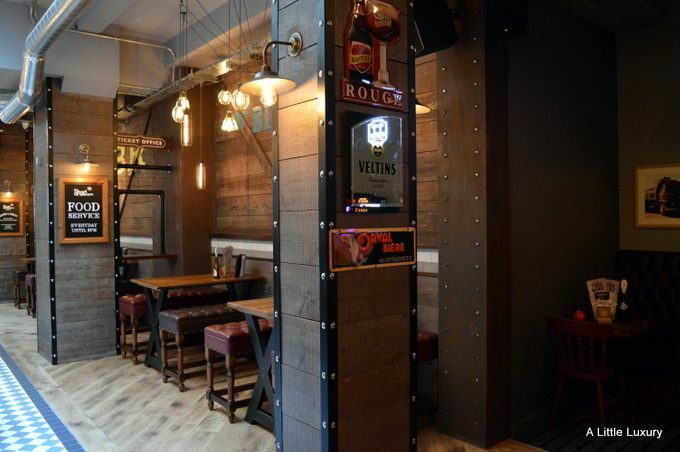 The Head of Steam, Temple Street, Birmingham opens today and adds something new to the Birmingham scene. We were lucky enough to get to try it out a day early on a press evening. Relaxed and casual in the heart of the city, it’s a comfortable, but modern, place to spend some time. I liked the decor whihch was a nice mix of hard and soft furnishings with some lovely quirky touches. My dinner companion said that he felt there were some slightly steampunk features and I could see what he meant. It’s a very inclusive place to eat and drink: dogs are welcome. I took my son who is 11 and very used to eating out – that felt very comfortable. 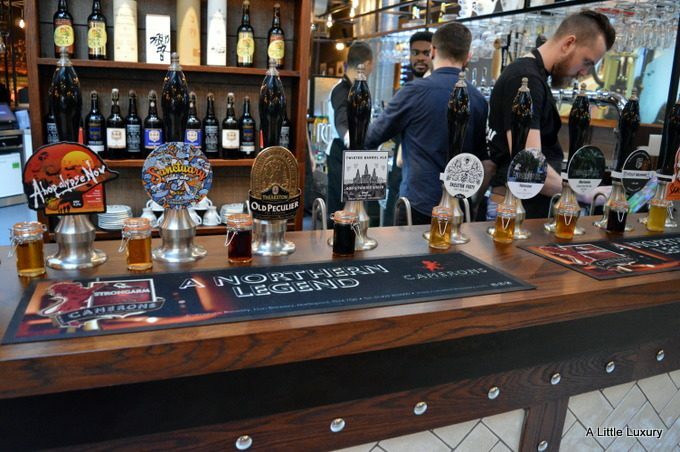 Lots of pubs and restaurants claim to offer a wide range of beers, and even have a whole menu for the beers, but when you ask for something like a regular bitter beer they can’t provide it even though they might offer a huge number of different beers. Thankfully, this isn’t the case with the Head of Steam and there are some traditional bitter style beers available. It would be nice to have more available and maybe a few less IPAs, but it’s nice to have a choice. I was drinking Camerons Strongarm, a well-rounded, ruby-red bitter, which is one of a number of hand pulled, cask beers. The other thing I liked was the samples of the beers so you could immediately see the colours and get an idea of which ones to try. The staff are also very willing to let you taste a little before you make your decision. We had a bowl of Nachos to share as a starter. There was a slight mixup and we ended up with the main course size instead, so no complaints there. 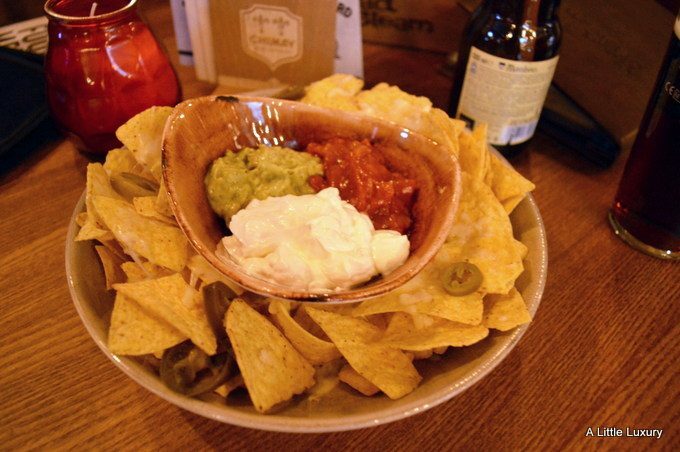 The nachos had melted cheese on the uppermost layer and served with three dips: salsa, guacamole and sour cream. Very moreish! For my main course I had Moroccan Harissa Marinated Salmon which was served with sauteed new potatoes, artisan Mediterranean vegetables and a sun blushed tomato & pea shoot salad. I liked the slightly spicy and very succulent salmon, but the dish was slightly spoilt for me by being served in a bowl. The salad was mixed in with the hot ingredients and was somewhat wilted as a result. I’d have preferred it served on a plate or with a different accompaniment. My son went for the Hot & Spicy Pepperoni & Chilli pizza. 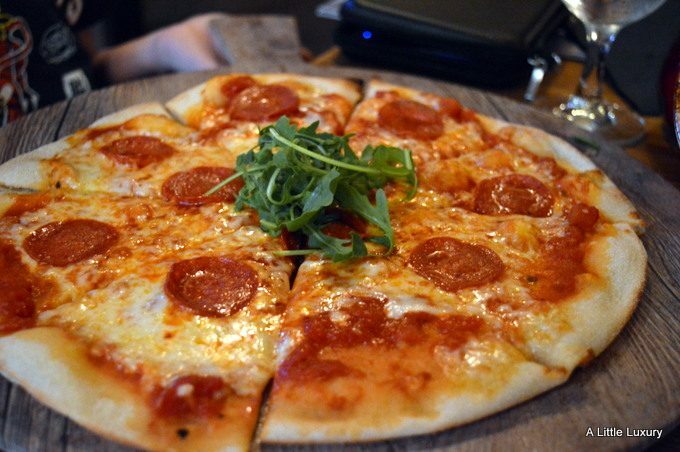 As you can see it’s a very thin crust pizza, which is just the way we like them. He did say it wasn’t that spicy and given the speed at which it was put away I’d say that was probably the case. I didn’t get a chance to try as it was so very popular. For dessert I had the profiteroles, which were served with butterscotch syrup. They came with a generous garnish of fresh berries which worked very well alongside the profiteroles. I think though I’d have preferred them topped with dark chocolate. 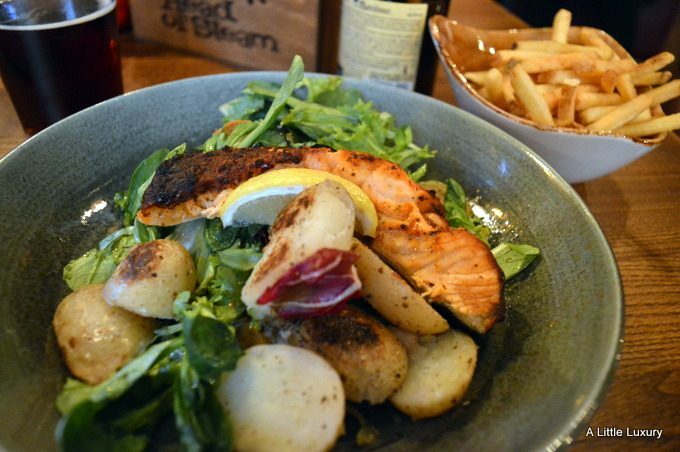 We really liked the Head of Steam and it’s the sort of relaxed and friendly place I can see us popping in for lunch to if I’m in town with my son or with friends. The food is well priced and good quality. I’m eyeing up the breakfast and brunch menu because that looks like the perfect way to spend a weekend morning. Its just around dinner time now and I am ooing and ahhing just looking at the delicious food. 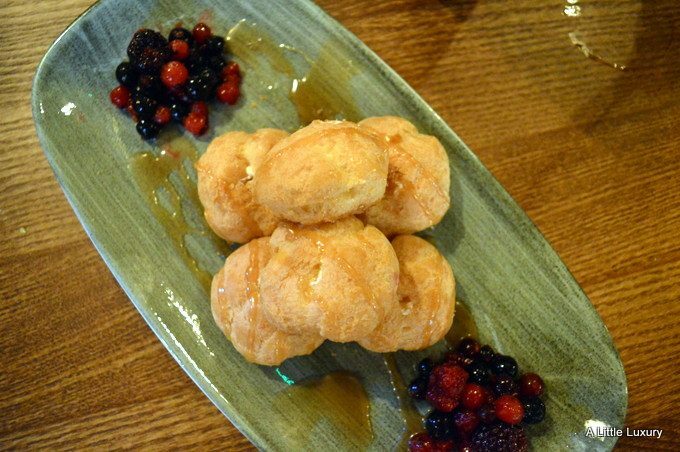 The salmon and profiteroles looks yum! This place sounds lovely, I wouldn’t be able to resist those nachos either! This place sounds great. Those nachos look delicious!